The month of Christmas baking is upon us! Our first batch included the stalwart maple pecan cookies (orange zest extremely optional) and, since Jess is on a mission to cook her way through the Duchess Bake Shop book, florentines. My cousin met this combination with “oh $#!&, my favourite cookies and some even better ones!” With near universal accolades, Jess and I still agreed that a pure shortbread or pate sucree base to the florentines may be preferable to the slightly crumbly almond dough used in the Duchess recipe. (Next up on the blog, we report back from our experiments with the near universally acclaimed nanaimo bar recipe! Stand by!) 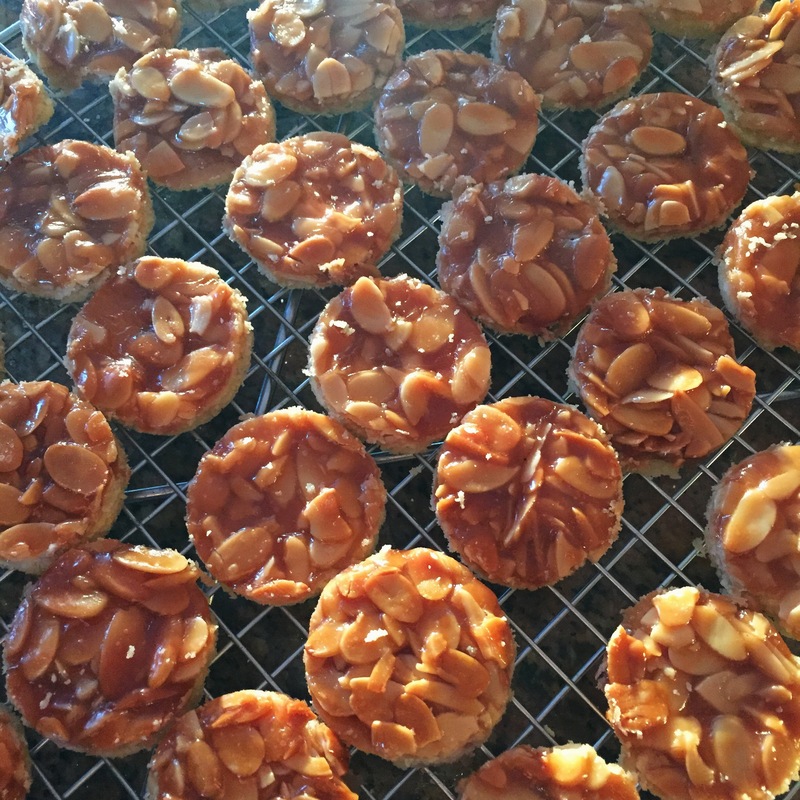 You can find a fairly similar recipe for almond bars here. Or perhaps these salted caramel shortbreads are more your speed? If you’re also starting to think about holiday baking you can find cookie recipes under the Recipe Recommendations header. I have also put together a quick guide to cookie party hosting, if that’s your jam! Does anyone have a hardy rose they swear by (other than rosa glauca)? Love Kelly and this interview! And, in case you were wondering, at no time has Sarah stopped being inspirational. I’m a big fan of holiday socializing over baked goods. Some years I book a solid week and a half straight of baking engagements, happily making cookies and bars with anywhere from one or two to twenty people at a time. One of my friends asked for tips on hosting his own cookie party, so I thought I’d write some up in hopes that you also consider hosting one. If you have a lot of friends who never bake then it can be a fun way to get them in the holiday spirit. While it’s doable to host as the only baker, it’s much easier if you have one or two friends who can keep an eye on various activities for you as you ferry things in and out of the oven and ensure everyone has what they need. 1. 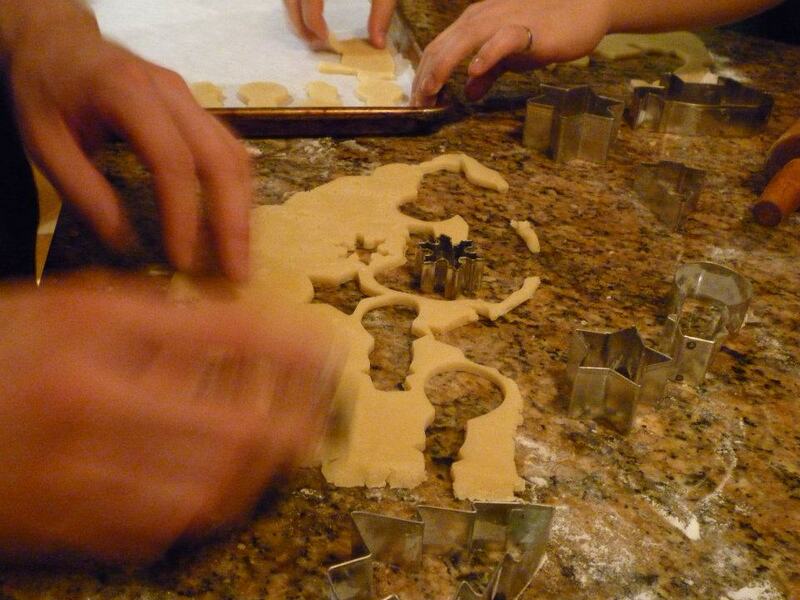 Make several cookie doughs ahead of time, estimating about 1 1/2 – 2 dozen cookies per person. My traditional choices: sugar, gingerbread and peppermint sandwich cookies. 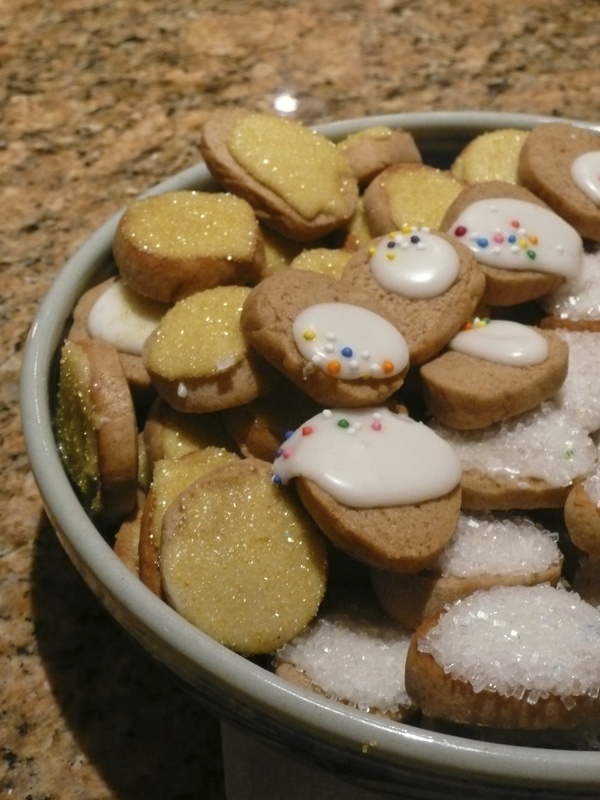 Buy a LOT of sanding sugars and those little metallic balls, plus any other sprinkles that look fun. Have some sandwich bags or ziploc bags you can use as piping bags. 2. Have at least 4 large cookie sheets, lined with parchment. If you have less, pre-bake half your cookies. 3. Set up all your stations ahead of time (cutting, cooling, decorating) and make royal icing just before everyone arrives. Also pre-heat your oven. If you have friends who bake, you can let them make any other icing during the party. 4. 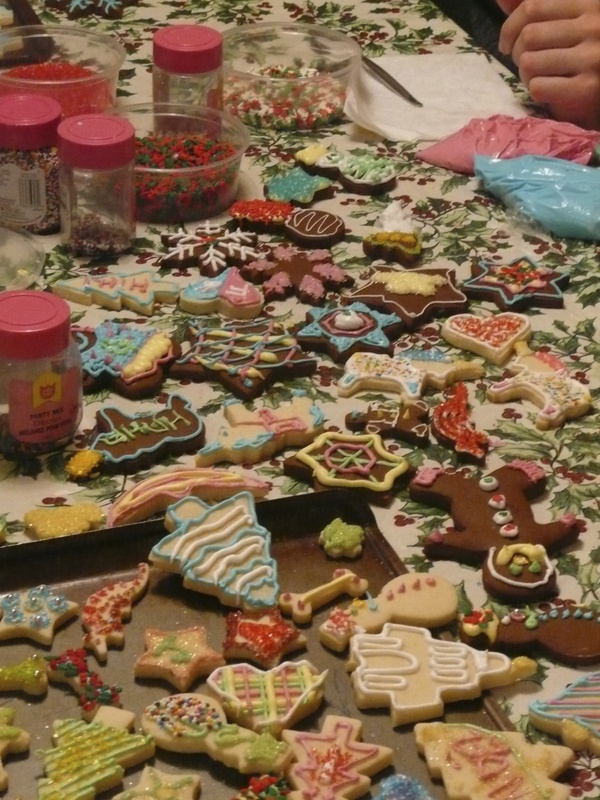 Start rolling and cutting cookies at your designated start time, even if no one is there, as long as you have finished your icing and done those dishes. It’s worth it to get some cookies into the oven and cooling. 5. 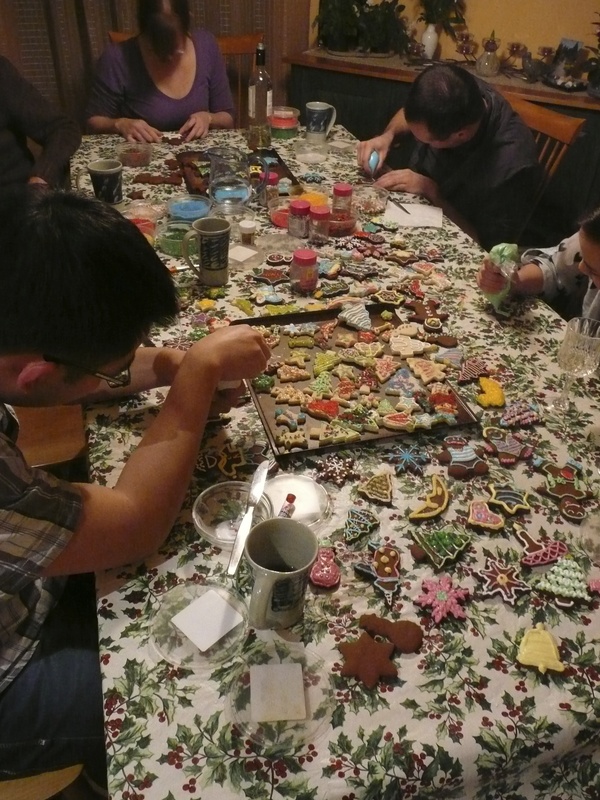 If people seem to be slowing on the decorating front, switch to your sandwich cookie production, or make people switch stations so no one is stuck cutting out cookies the whole evening. 6. Make sure you circulate! Having a friend or two who can watch the oven is so helpful. Provide beverages (I find tea and water to be most appreciated as everyone is consuming so much sugar) and make sure everyone has what they need. As the cutting station wraps up you can begin the process of cleaning up, drafting in people to help as you feel comfortable. I find it’s all in the spirit of the evening and no one minds. 7. Make people take home ALL THE COOKIES. – Don’t eat any cookies. This seems counter-intuitive, but trust me, the party is much more enjoyable when you aren’t sugar-crashing every 5 minutes. The reality is, this kind of party is quite a bit of work and you need to be on your game to ensure that nothing burns and that you can follow conversations with people you haven’t seen in 12 months. Hydration! That’s what helps. – Set your oven timer so it beeps when you rotate the trays. Basically every 4 minutes you’re checking the oven. – If you’re a perfectionist, it’s best not to watch anything too closely. Just make sure the cookies aren’t too close together on the sheets and don’t come out burned and call it a day. 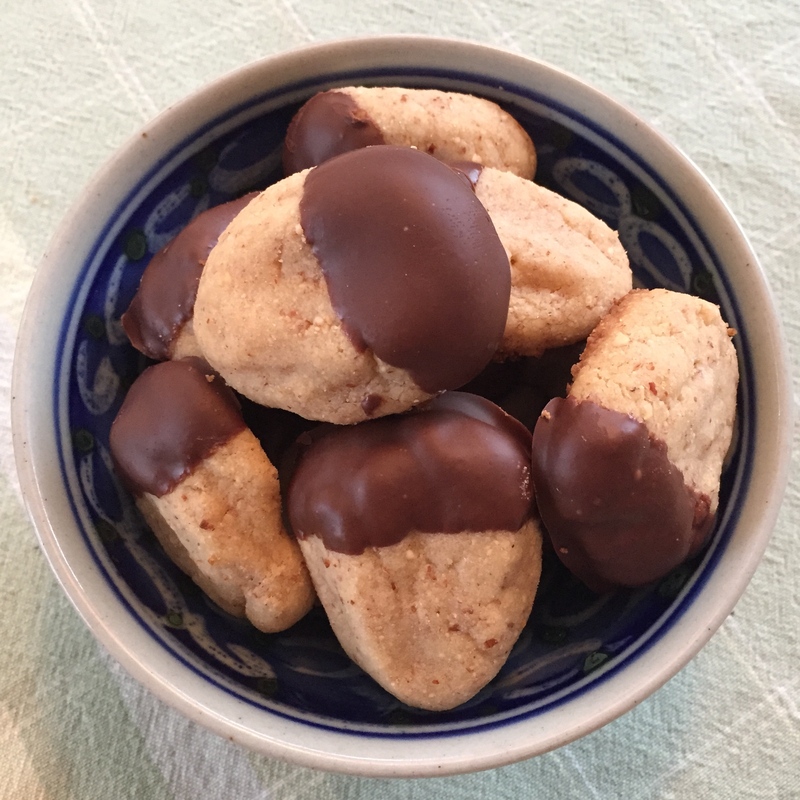 – It can be good to have one or two kinds of cookies pre-made if you want people to take home a nice selection. – If your guests are all bakers you can make more kinds of cookies, space allowing. Definitely increased chaos but of an entertaining and productive variety. Can you believe that it’s almost been a year since we started? I know, I use the term “we” loosely, as you have been carrying this blog alone for months. Thank you. We are another year older (your birthday is a mere 2 days away!) but not necessarily wiser. Perhaps a little more cynical than we should be on some days…most days. You still like me despite my propensity to make lofty unattainable goals and do crazy, stupid (times a million) things, and I love your wavering level of sanity and your lovely little laugh (especially when laced with disdain). And so, I aspire to contribute more frequently, as I am working a mere 69 hours/week as opposed to the 70 I’ve been keeping for the last 6 months. Haha. I kid. But I should have a bit more time soon, and I will do my best. 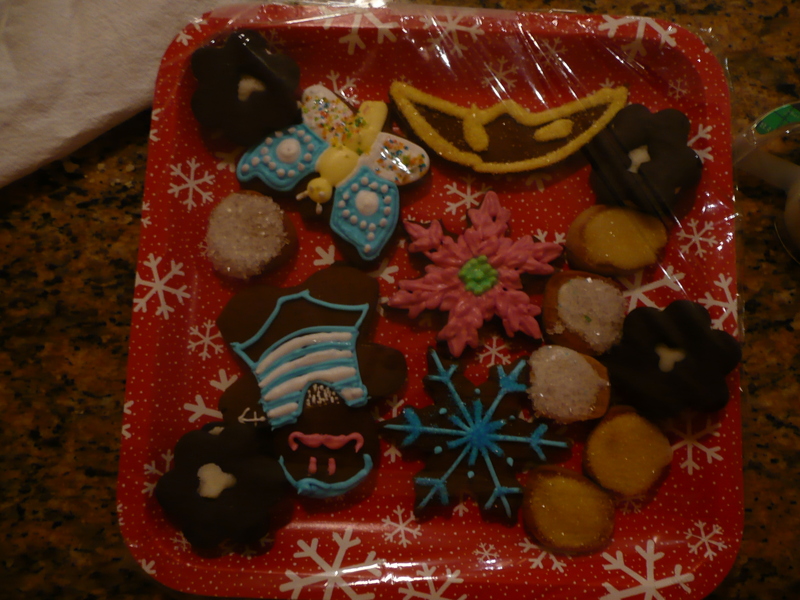 I made these cookies because I felt the need to be a kid again, just for a bit. When I was little, I had a thing for Wagon Wheels. I only ever had them at other kids’ houses, as they were never in our household, and there was something about their gooey marshmallow centre and chocolate coating that stuck with me. I suppose, I don’t have to convince you, Aim, of that, as I have recently learned about you and marshmallow fluff (GASP!). Lately, I’ve been really trying to understand money and financial matters, but some part of me just shuts down and I have a really hard time understanding anything related to my bank account. Surely it can’t be any more complicated than “Save more than you spend”, right? This, plus the recent string of events that have taken place in far away lands, my new grown-up job that terrifies me every shift, and looking for a new apartment in Calgary…suffice to say, I hate being a grown-up. And so, I bring to you my version of a chocolatey marshmallowy delight. 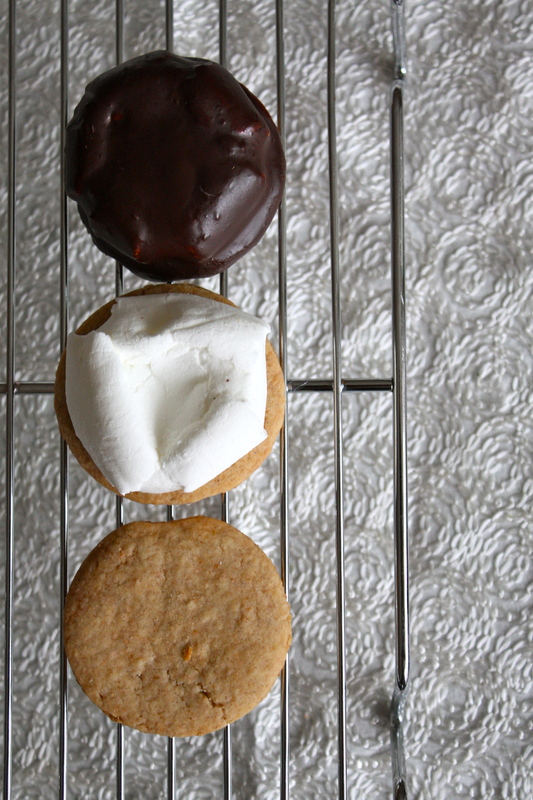 The cookie bottom is delicious on it’s own, with jam or the chocolate ganache sandwiched in-between, but the real fun is smooshing the marshmallows into the cookie. Om nom nom. They taste much better the day after, as the cookie has softened a bit and the whole thing sticks together a little easier after the chocolate hardens. My ganache coating didn’t harden to the point of cracking, but it did the trick. P.S. On a totally un-related note…’cause I’m like that…I am OBSESSED with Birdy. So much talent, and she’s only, like, 15. Ridiculous. Whisk together flours, cinnamon, baking soda, and salt. Set aside. With an electric mixer, beat butter until slightly lightened in colour, then add sugars, creaming until fully incorporated. Add honey, egg, and vanilla. Divide into two discs, wrap in plastic wrap, and refrigerate for at least 2 hours until firm. Preheat oven to 350 F. Roll out each disc on a lightly floured surface, about 0.5 cm thick. Cut out circles using a 2-inch round cookie cutter. Bake for about 10 minutes. Remove cookies from the oven, but leave it on. 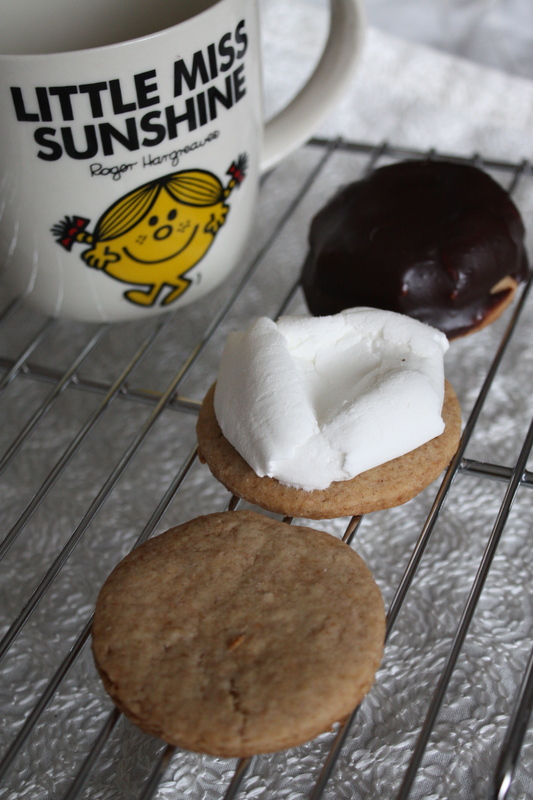 This is the fun part: place a marshmallow flat side down on each warm cookie and return to oven for 2 minutes. Do not overbake, otherwise the marshmallow will start to melt. Using the palm of your hand, lightly smoosh the marshmallow into the cookie, aiming for round-ish edges, but honestly, if it’s bumpy, don’t worry about it at all. Still delicious. Promise. Let cool. While they’re cooling, put your chopped chocolate into a bowl. Put the cream and corn syrup into a pot over the stove, and bring to a simmer. Add the hot cream mixture to the chocolate and stir until the chocolate is melted and you have chocolate ganache! Ta da! The ganache will start to thick as it cools. When it gets to a thick chocolate syrup consistency, where it’s not entirely runny and shows signs of resistance, that’s when it’s good to go. 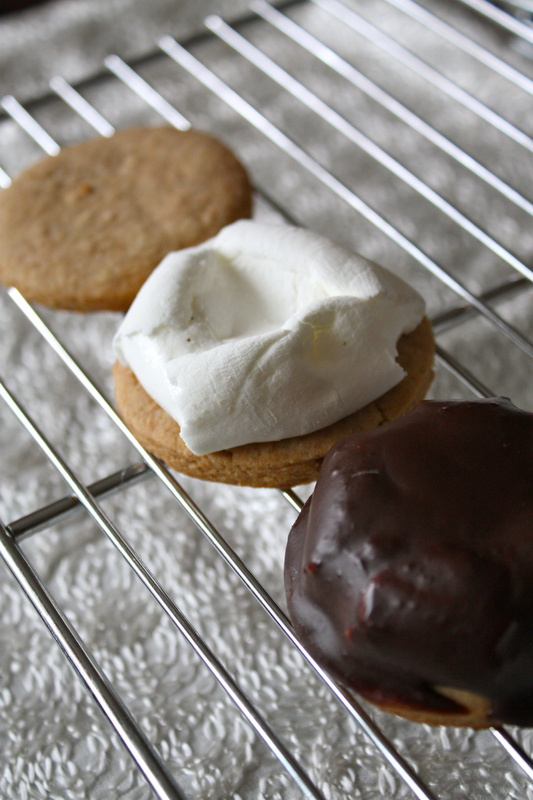 Dip the cookies, marshmallow side down, into the ganache, and place on a cooling rack to set. For mess control, it’s best to place the cooling rack over a cookie sheet. I didn’t dip the bottom of the graham cookie in the chocolate, but I don’t see why you couldn’t. Leave to cool/harden in the fridge overnight.